Emerson SolaHD SDN2X redundancy modules continuously monitor two power supplies connected in parallel. In the event one power supply fails, the SDN2X automatically changes over to the second power supply, eliminating the potential for single power supply failure causing an unexpected shutdown resulting in costly system downtime. Because the power supplies are decoupled via the module, the operating power supply doesn't feed into the failed power supply. "SDN2X redundancy modules provide more extensive features and certifications than any existing redundancy models, at the same price, and in a smaller package," said Patrick Murphy, Product Manager, Emerson Automation Solutions. "Since the modules work well with combinations of SolaHD SDN-C, SDN-P and SVL power supplies, as well as many competitors' power supplies, it's easy for customers to transition to the new modules for improved protection." SolaHD SDN2X redundancy modules incorporate a MOSFET design which generates less heat than diode-based redundancy modules. Less heat translates to longer life of the components housed in the same enclosure as the power supply. In addition, their compact design saves valuable panel space. Extensive international certifications, including UL, CSA, CE, ATEX, IECEx, ExEAC, ABS, and DNV-GL, ensure the modules operate with 100 percent reliability in harsh environments, hazardous locations and marine applications. They provide an added level of protection for systems found in petrochemical and gas facilities, industrial manufacturing, machine tools, wastewater treatment centers and power generation plants. 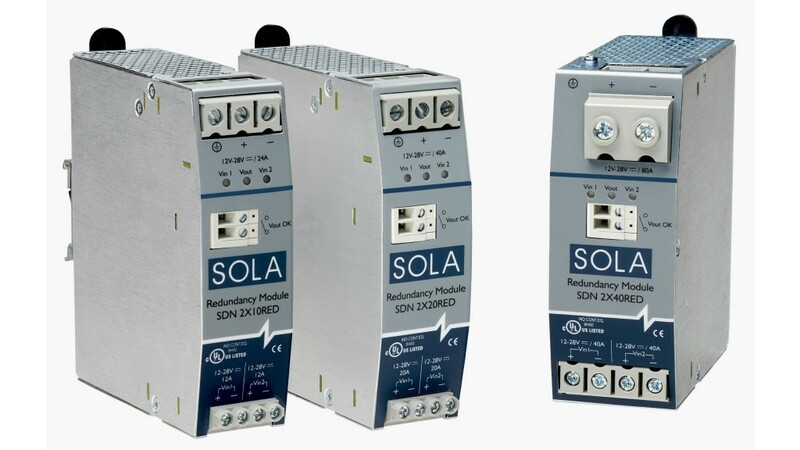 SolaHD SDN2X redundancy modules feature powerful diagnostics via three bi-color LEDs, while a relay output provides power output status information to a PLC or other control equipment. Three sizes of SDN2X redundancy modules are available. Each module supports redundancy between two 12VDC or two 24VDC power supplies. Each of the two connected power supplies can have a capacity of up to 10A (SDN2X10RED), 20A (SDN2X20RED), or 40A (SDN2X40RED).